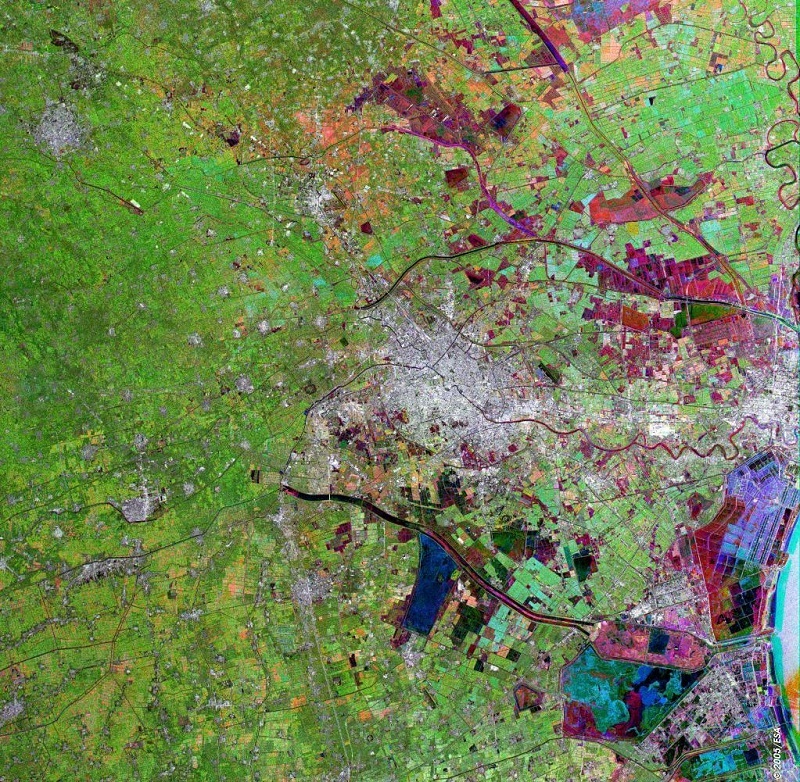 Envisat’s ASAR sees Tianjin, China’s third largest city. Image courtesy of ESA. Last month a paper was publishing in the Remote Sensing journal demonstrating that the city of Beijing is gradually sinking as a result of subsidence. The paper ‘Imaging Land Subsidence Induced by Groundwater Extraction in Beijing (China) Using Satellite Radar Interferometry’ by Chen et al described work undertaken by a team of researchers using satellite images from between 2003 and 2011. The research was undertaken using Interferometric Synthetic Aperture Radar (InSAR), which is a microwave based technique that uses phase measurements from two or more successive satellite SAR images to determine the Earth’s shape and topography and so to measure millimetre-scale changes. The study used 41 images from Envisat-ASAR acquired from 2003 to 2010 collected in Stripmap mode with VV polarisation, together with 14 images from TerraSAR-X acquired from 2010 to 2011 also in Stripmap mode, but this time using HH polarisation. 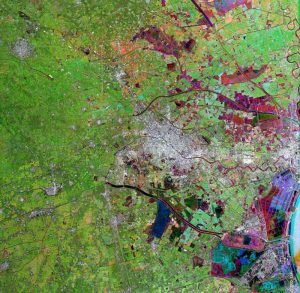 The images were processed alongside some baseline interferograms and the Shuttle Radar Topography Mission (SRTM) Digital Elevation Model, at 90 m resolution, to produce land subsidence information. The results showed that parts of Beijing, such as the business district of Chaoyang, had sunk by as much as 11 cm within a year. In addition, they estimated that parts of the city had sunk by more than 75cm during the course of the eight year study period. Land subsidence is often caused by human activities and the researchers identified the main cause to be the extraction of groundwater from beneath the city. Beijing has an enormous appetite for water and is the fifth most water-stressed city in the world according to a 2014 report published by the Nature Conservancy. However, the amount of groundwater extracted was not the only factor with the researchers also seeing relationships with soil type, aquifer type and distance to the pumping wells. In addition, given the number of buildings that have been erected in Beijing in the last fifteen years the additional weight is also likely to be contributing to the problem. This sinking is not noticeable to the inhabitants of Beijing, but there is concern how this subsidence will impact the transport infrastructure, particularly high speed trains and research is already underway on this area. It is also not just Beijing that’s suffering from subsidence. The research also identified 45 other areas across China as having had or having significant land subsidence. In addition, Mexico City is sinking by between 6 cm and 28 cm per year and the Indonesian capital of Jakarta has dropped by around 8 cm per year; both are due to groundwater extraction. Even London is sinking, although in our case it only 1 – 2 millimetres per year! Water is a precious resource and one that is necessary for growing populations and economies alike. Research such as this demonstrates why the world needs to get better at water conservation. If we continue as we are, there could be potentially serious consequences for parts of the globe. How to Measure Heights From Space? This entry was posted in Data, Earth Observation, Envisat, Remote Sensing, Research, Space Can Help, Space Industry and tagged Beijing, Digital Elevation Model, Evisat, groundwater, groundwater extraction, HH, Imaging Land Subsidence Induced by Groundwater Extraction in Beijing (China) Using Satellite Radar Interferometry, InSAR, interferograms, Interferometric Synthetic Aperture Radar, Jakarta, land subsidence, London, Mexico City, Nature Conservancy, polarisation, remote sensing, Remote Sensing Journal, Shuttle Radar Topgraphy Mission, Sinking, stripmap, TerraSAR-X, VV by Andy. Bookmark the permalink.